This is one of the most elegant and conceptual places in Kiev with its unique location in a very heart of the Architectural Centre Old Kyiv and a particular aura of this place. The hotel main front opens on the Andriyivsky Uzviz (Monmartre of Kyiv filled with art shops, exhibits, cafes, beauty and charm that is tourist favorite place to visit), while the Terrace Restaurant overlooks the green hills and offers many wonderful garden terraces and a beautiful summer terrace with a splendid panoramic view. Restaurant “Terrace”, lobby bar and patio, room service, car hire, shuttle service (surcharge), airport shuttle (surcharge), 24-hour front desk, tour desk, ticket service, luggage storage, ATM/cash machine on site, concierge service, laundry, dry cleaning, Ironing service, shoeshine, meeting/banquet facilities, business centre, gift shop, free WiFi, parking. The compact room of 9m2 is an ideal choice for a transit traveller. A comfortable single bed of 130sm width, a desk with Wi-Fi access, a wardrobe and a luggage cupboard are at your full disposal. The room overlooks the enclosed court of the hotel. The bathroom is equipped with a shower. 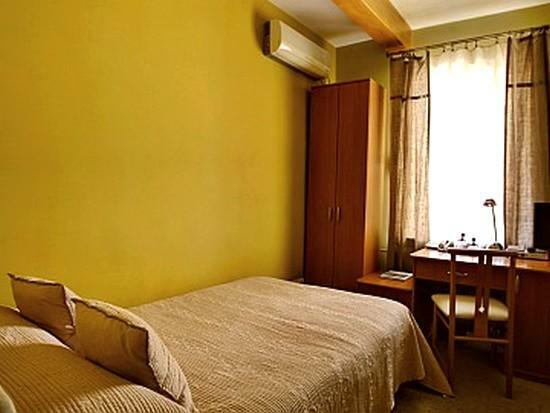 Very cozy room of 14-15m2, with a double bed of 160/180sm width or with two separate beds of 100sm width. A desk and Wi-Fi access, a lounge space furnished with the comfortable armchairs and a floor lamp are at you full disposal. The room is decorated with the art works of modern Ukrainian artists. Windows (1 or 2) overlook the hotel's patio or Andriivsky uzviz. The bathroom is equipped with a shower. The stylish room of 11-14m2, with a comfortable bed of 130sm width. A desk, a Wi-Fi access and a lounge space furnished with a luxurious armchair and a small table. The room is decorated with the art works of modern Ukrainian artists. Windows (1 or 2) overlook the hotel's patio or Andriivsky uzviz. The bathroom is equipped with a shower. 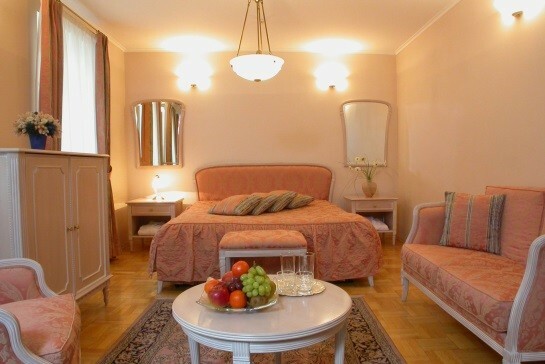 Smart and very light romantic room of 26m2 furnished with the pale pink Italian furniture with silk upholstery in a boudoir style. Comfortable double bed, elegant divan, armchair, small table, cabinet with the exclusive French tableware from Obernai, a desk and Wi-Fi access are at your service. Three windows overlook the hotel's patio. For your comfort the windows are set off with obscuring curtains and the lighting is adjustable. The bathroom of 4,6m2, with Jacuzzi and a window keeps up with the boudoir style. There is also a separately located shower and a toilet. Spacious and light room built in L-shape of 31m2. Four wide windows overlook wonderful panorama of Andriivsky uzviz and renewed Vozdvizhenska street. Comfortable double bed could be curtained if desired. The wall decorated with patinated mirror gives the room special charm. 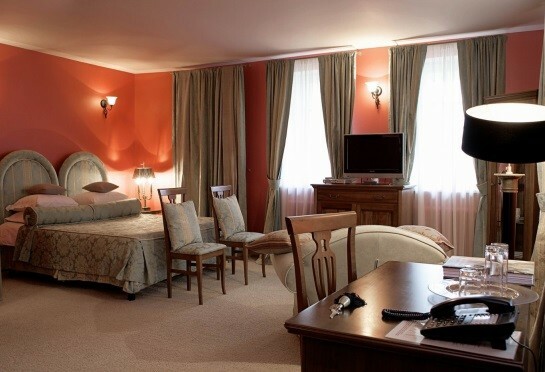 To make your staying even more cozy the room is furnished with comfortable armchairs and a stylish floor lamp. The desk, Wi-Fi access and exclusive French tableware from Obernai are at your service as well. The colour solution here could be described as kind of berry, an energetic one. The bathroom is of 4m2 and equipped with a bath. The exclusive interior of the living room and luxurious bed with bed curtains in the bedroom. 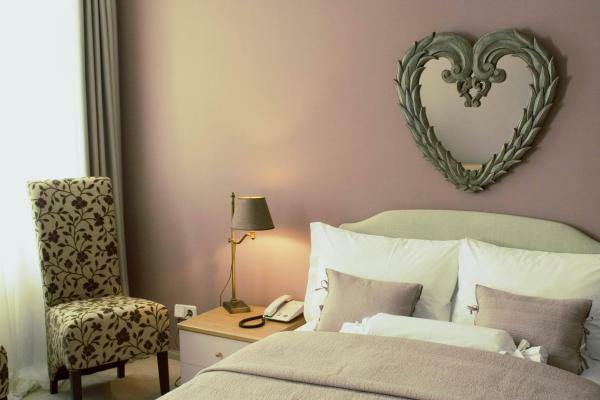 The room is performed in smooth pearl grey and lavender colours. It is also decorated with both vintage and modern natural flax. Table lamp and pictures’ frames are from famous Italian brand Chelini. The folding sofa will make staying with children very comfortable. The room overlooks the hotel's patio. 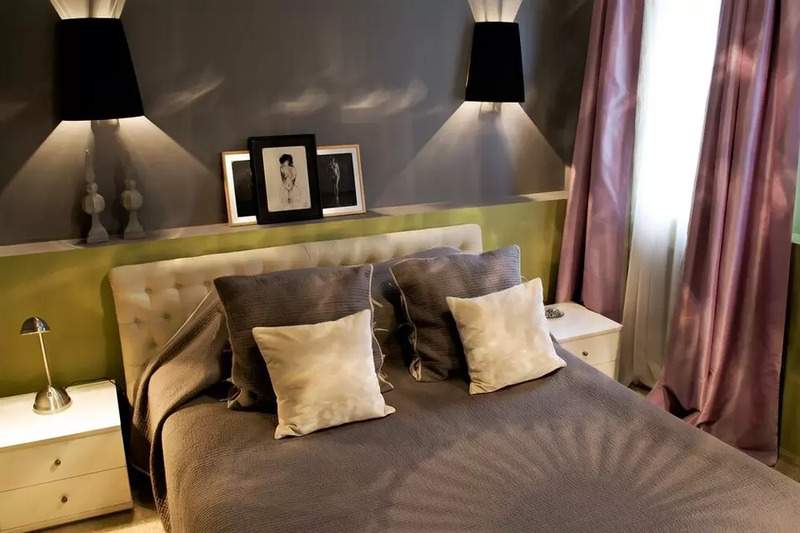 Smart and at the same time austere style of the room is performed in noble olive green colours. A spacious living-room is furnished with sofas, desk and stylish lamps. In the bedroom there is a big bed, silk curtains set off the window, which harmonize with the light-coloured carpet on the floor. The folding sofa will make the staying with children very comfortable. The room overlooks Andreevsky uzviz. 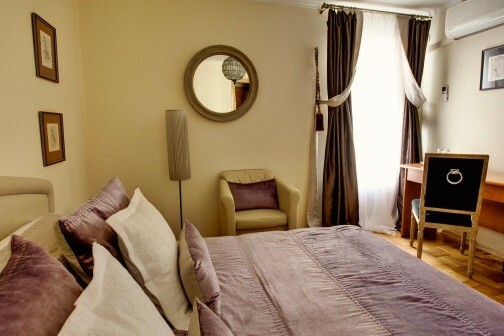 The hotel Vozdvizhensky offers optimal solutions for complex tasks in organizing business meetings, conferences in Kiev as well as special events related to receiving guests. The boutique-hotel is taking leading position in the market of conference services in Kiev and offers optimal solutions for the whole package of various tasks in organizing business meetings, conferences and also special events related to receiving guests. Depending on the concept of your event and the amount of people participating in it, you can choose from Universal Conference Hall and Small Hall, the hall of the restaurant Terrace, summer terrace, and other various locations. The team of highly-professional managers of Vozdvizhensky is eager to create the necessary atmosphere and interior as well as provide the high-quality assistance in executing your event. Terrace Restaurant will provide you with coffee breaks, lunch, coctail, fourchette or banquet.